This entry was posted in Lara Gabrielle Fowler and tagged Bette Davis, blogathon, dueling divas blogathon, miriam hopkins. Bookmark the permalink. Can I join in? I was thinking I could do a post about Olivia Di Havilland and Joan Fontaine! Hmmm – I am thinking of doing “The Prime of Miss Jean Brodie” – Miss Brodie (Maggie Smith) and Sandy (Pamela Franklin). Hey Lara! Would it be fair game if I choose Kathy Seldon vs. Lina Lamont in “Singin’ in the Rain”? Lara, I’d like to really bend the rules. I’d like to do Gregory Peck vs. David Niven in “The Guns of Navarone”. That’s not bending the rules! We’re gender-neutral here 🙂 And very much pro-creativity. I’ll mark you down! 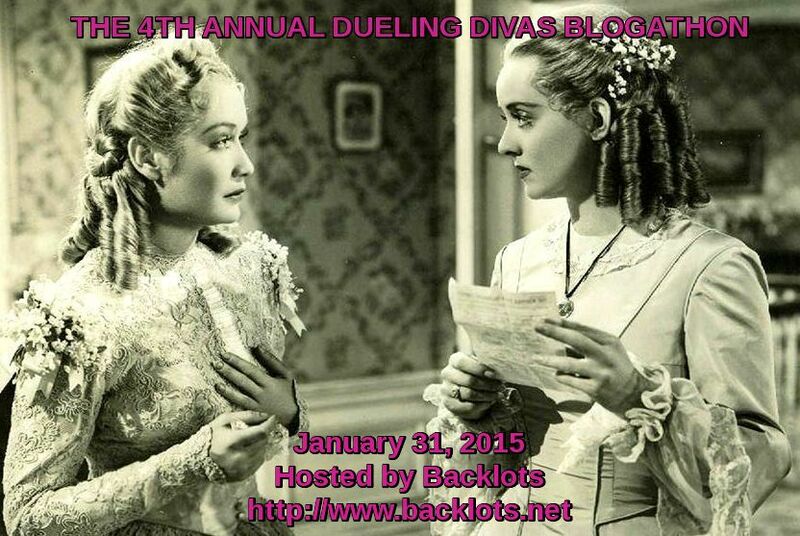 Hi Lara – I’d like to participate in the upcoming “Dueling Divas” Blogathon. In fact, by the time this blogathon debuts, I shall be proud the writer of a blog myself: “CineMaven’s Essays from the Couch.” ( When I jump in, I really jump in.) I’d like to tackle Myrna Loy vs. Esther Williams in “Libeled Lady” and “Easy to Wed.” In fact, what I really want to do is pit both movies opposite each other. I say ‘go big’ or ‘go home.’ Would that be okay? Greetings! I would like to cover Constance Talmadge’s dual role in Her Sister from Paris… and I will also discuss its talkie remake, the infamous Two-Faced Woman (in which Garbo merely pretends to be two people so not technically a dual role but…) So, double dueling and dualing for your money. I’m down to do Ann Dvorak vs Bette Davis in Housewife (1934). How about an Olivia De Havilland double-feature in The Dark Mirror? Wonderful! I’ll mark you down! Lots of creativity this time around! Usually we like to keep the focus on characters, but I’ll bend the rules for my friend Theresa 🙂 You’re on! Hi! I’d like to write about Barbra Streisand’s dual roles (Daisy Gamble/Melinda Tentrees) in On a Clear Day You Can See Forever. Hi! I’d like to write about the great, underappreciated, and unavailable on DVD last film from the fabulous director Robert Aldrich: “All The Marbles.” It is about the world of women’s wrestling and its stars, Vicki Frederick (A Chorus Line) and Laurene Landon (Airplane 2) get in many duels in the wrestling ring! Hi there! Could I take on Rags Ragland’s dual role in WHISTLING IN DIXIE? My favourite annual blogathon! Please could I write about the did-they-didn’t-they Dietrich and Garbo? Sure! I’ll put you down! I had sent a suggestion but got no response. Shall I assume it was not accepted? Oh, I’m sorry, I don’t think I got it! Can you send it again? Oh my! Sounds like fun! Oooh, love that movie! Yes indeed! I would like to do Ridley Scott’s “The Duellists” that starred Keith Carradine and Harvey Keitel, a modern classic from 1977. Ok? Would love to explore the dynamics between Kim Novak and Rita Hayworth in Pal Joey! Mother, may I? I know I’m late to the party, but may I join and write about Bing and Hope in the Road films? Dear Backlots, are you still accepting submissions? I’d like to write something about lost film Die Falsche Asta Nielsen – The False Asta Nielsen (1915). Sorry, I meant to say also that it is a film in which Asta Nielsen plays a dual role. Now that I’m blogging again, I’d love to take part in this! May I do Joan Crawford and Diane Baker in William Castle’s Strait-Jacket? Hi Lara, if not too late, may I take on Edward G. Robinson as Arthur Ferguson Jones and “Killer” Mannion in The Whole Town’s Talking (1935)? If that’s taken, my 2nd choice would be Charlie Chapin’s duel role in The Great Dictator. Is that ok? Thanks! Hi Lara! I hope I’m not to late to subscribe to this blogathon. Well, I would like to talk about the opposition between the characters of Bonnie Parker (Faye Dunaway) and Blanche Barrow (Estelle Parsons) in Bonnie & Clyde. And what a good idea this blogathon! Yes, definitely! Glad you’re blogging again! Hi Barry, I just checked the link and it goes through. Was it not working for you?